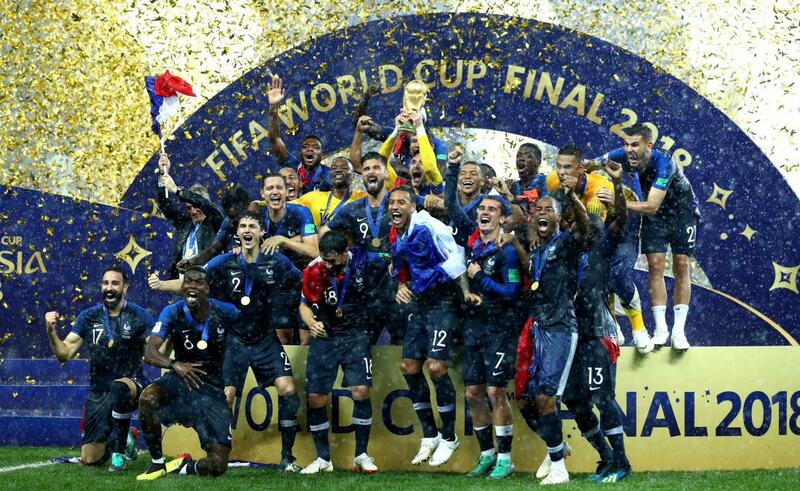 The 21st FIFA World Cup held in Russia came to an end on Sunday as France triumphed over Croatia to win the game 4-2. This is the second time France has won the World Cup; the first was in 1998, where current head coach Didier Deschamps became the third man to win the World Cup as a player and coach. It certainly wasn’t easy as they battled their way through top team after top team in qualifying and in the actual tournament to finally be able to call themselves world champions. To properly look at France, we must start at the beginning, back to the final of the European Championship against Portugal in 2016. France hosted this tournament and was expected to win the entire thing. But disaster struck during extra time when Portugal scored the only goal of the game, leading Portugal to secure the title and France distraught. Not only did France lose a final, but the loss was extremely disheartening since the team played in their own country. Questions were raised about how France was going to respond going into the future. France was quick to answer its critics as they breezed through qualification as the team finished first in their group, only losing one game in ten qualifying matches. Along the way, some old players of the squad were cast aside to make way for the new generation of French soccer. Players such as Kylian Mbappe (19) and Benjamin Pavard (22) entered the selection mix to bolster the already talented squad containing the likes of Paul Pogba (25) and Antoine Griezmann (27). By the time that all the squads were selected, France had the second youngest squad of the tournament having an average age of 26. Things were definitely looking up for this young and exciting French team. Going into the tournament, France was in a pretty on-and-off form picking up wins against the likes of Italy, Russia, and Ireland as expected, but at the same suffering a defeat at the hands of Colombia after going 2-0 up but later conceding 3 goals. They also drew a game to the United States after going down initially to a goalkeeping mistake. This definitely raised some concerns about the state of France’s defense; adding to the defensive problems was the fact that one of France’s most experienced defenders Laurent Koscielny was excluded from the squad due to an injury from the domestic soccer season. However, before the tournament, Koscielny sent a letter to the French squad. Koscielny said in his own words that the contents of the letter was basically to “get along with each other, all together, players and staff” and said, “I”ll be on the sofa, watching the TV and I’ll be your No 1 fan”. The head coach (Didier Deschamps) gave every single player on the squad a copy of that letter to make sure they understand the importance of unity, not only with teammates but with everyone involved in the World Cup campaign. On June 16th, France’s World Cup campaign had finally begun. France was drawn in a group that included tough teams like Denmark, Australia, and Peru, but France was definitely expected to come out on top. The first match that France played was against Australia, and France looked far from convincing. The team still managed to win the game 2-1 but was partly aided by the VAR (Video Assistant Referee), who overturned an earlier decision that had resulted in a penalty that Antoine Greizmann slotted home with ease. But then, French defender Samuel Umtiti gave away a penalty from a handball, which could have been easily avoided. Australian captain Mile Jedinak slotted it home and the score was tied at 1-1. The game looked done and dusted, until Paul Pogba came up big with a shot in the 85th minute that barely passed the goal line, giving France the lead once again (official records state that it came from an Australian player so it was awarded as an own goal). As the full-time whistle blew, France won, but some questions still had to be answered. In their second match, France came up against Peru, whose players were like dark horses coming into the tournament. Peru actually lost their first game against Denmark which put them in a do-or-die position for qualification to the next round, while France was in a position to confirm their place in the next round with a win here. In the end, it was France who came out on top with a 34th-minute finish by 19-year-old Kylian Mbappe, making him the youngest goalscorer in the World Cup for his country. Peru at times looked dangerous, but with some key saves made by French goalie and captain Hugo Lloris, France managed to win the game in the end and qualify for the knockout stages of the World Cup. The final match of the group stage was against Denmark which turned out to be the only goalless draw of the entire tournament. Denmark qualified to the knockout stages and France secured 1st place in the group. As the group stage concluded, France managed to come out on top with a bit of luck and some solid play. If we could pinpoint a moment where France started to look like world champions, this is where it began. The round of 16 match where France played against Argentina can be looked at as one of the best games, if not the best game, of the tournament. Argentina, led by Lionel Messi, struggled in the tournament and barely made it to the knockout stages. However, a late goal scored by Marcos Rojo in the 86th minute confirmed Argentina’s place in the knockout stages. This prompted people to believe that Argentina had finally found its feet in the tournament and that Messi, who is now 31 years old, had been given his last chance to take home the biggest prize in world soccer. This game started off in an emphatic fashion. In the 11th minute, Kylian Mbappe drove forward from the halfway line, going through the Argentinian defense with blistering pace until he was finally brought down inside the penalty box by Marcos Rojo, which prompted the referee to award a penalty to France, which Antoine Greizmann slotted home again as France took the lead 1-0. But later, in the first half in the Argentinian forward, Angel Di Maria made a long-range shot which went into the back of the net as Argentina got one back. As the half-time whistle blew, it’s 1-1. The second half began on a sour note for France as they conceded another goal courtesy of a deflection off of a Lionel Messi shot, as Argentinian right-back Gabriel Mercado got a touch to the ball and directed it to the opposite side of the goalkeeper. But France was quick to respond. Only 9 minutes after conceding, center back Benjamin Pavard converted to a right-back and struck a half-volley into the back of the net, which can be considered one of the goals of the tournament as France draw level once again with Argentina. After that, France started to dominate the game in the space of 11 minutes after the equalizer. Once again, the young superstar Kylian Mbappe scored two great goals to give France a little breathing space into the final 20 minutes of the game. Kylian Mbappe became the first teenager to score in the knockout stages of the World Cup since the legendary Pele did all the way back in 1958. A late consolation goal was scored by Sergio Aguero was scored in the 93rd minute but by that point, it was too late, as France emerged victorious with a scoreline of 4-3. Kylian Mbappe played out of his mind during this game and in the eyes of the people, this could have signaled a passing of the torch moment from Lionel Messi who is considered one of the greatest of all time to this 19-year-old who was many more amazing years to come to become a true legend of the game. France’s next test was against Uruguay, whose tournament run was very similar. Uruguay started off slow in the group picking up close wins against Egypt and Saudi Arabia before stomping its place in the competition with a dominating performance against the hosts Russia. In the round of 16, France played against European champions Portugal, led by another great of the game, Cristiano Ronaldo. Uruguay powered through as the dangerous striking duo of Luis Suarez and Edison Cavani (who scored the two goals) proved too much for the Portuguese as Uruguay won 2-1. Going into this game against France one half of Uruguay’s dynamic duo Edison Cavani was injured which proved to be a major blow in the end. France took the momentum from beating Argentina and ran with it. Antoine Greizmann sent in a wonderful ball into the box that allowed French defender Raphael Varane to slot it with his head. French goalkeeper Hugo Lloris also came up big making some key saves during the 90 minutes to keep Uruguay from scoring. The final nail on the coffin for this game was powerful; Antoine Greizmann’s shot went through the hands of the Uruguayan goalkeeper Fernando Muslera and into the back of the net making that Antoine Greizmann’s first goal of the tournament that wasn’t from the penalty spot. As the final whistle blew, France won the game 2-0 and moved onto the semifinals with a lot of momentum. Next, France played Belgium, who looked just as good, if not better than France leading up to this point. In the group stage, Belgium had topped with ease and staged an amazing comeback against Japan in the round of 16, coming from 2 goals behind to win the game 3-2. This all happened in the space 30 minutes in (as they scored the third goal of the last kick of regular time to prevent playing another 30 minutes), but most impressively, France beat the heavy favorites Brazil in the quarterfinals to get to this stage of the tournament. The game was a long and hard battle, both sides looked like they were capable of winning it all. Hugo Lloris came up big once again forcing a save in the first half with a full stretch dive for the ball. The Belgian goalkeeper Thibaut Courtois (who later won the golden glove for the best goalkeeper) also made some equally impressive saves to keep Belgium in the game. But it was one header that made the difference in the end. From Antoine Greizmann’s corner, Samuel Umtiti (who earlier in the tournament gave away a sloppy penalty) headed in the ball into the back of the net to give France the only goal of the game as they advanced to the finals of the World Cup for the first time since 2006, where Zinedine Zidane infamously headbutted Marco Materazzi to get sent off, resulting in France losing that game to Italy. Finally, it was time for the last game of the World Cup. Out of the 32 nations that entered this World Cup only two remained, France and Croatia. Croatia had probably had one of the most exhausting of the tournament but they never gave up. All of their knockout games went into extra time meaning that they technically played an extra 90 minutes compared to France if you add it all up. They won on Penalties against Denmark and Russia, while against England they scored a goal in the 109th minute of extra time to book there place into the final. Croatia, a nation of only 4.2 million people, was the second smallest nation to ever make the World Cup final (The smallest nation was Uruguay all the way back in 1930 which had only 1.7 million people at the time). Croatia went fast from the get-go, delivering balls and making runs into the box that looked very dangerous, but it was France who drew first blood, courtesy of an own goal by Croatian striker Mario Mandzukic, who headed the ball into the back of his own net after trying to clear the ball from Antoine Greizmann’s free kick (this was the first World Cup final own goal in history). Croatia was quick to respond as Ivan Perisic power in the ball with a shot into the bottom right corner. Shortly after the equalizer, VAR struck once again as Ivan Perisic, the scorer of Croatia’s previous goal, was caught making contact with the ball using his hand due to the assistance of VAR, as the referee overturned his earlier decision of no handball and gave France a penalty kick. Once again Antoine Greizmann stepped up to the plate and delivered for France as he scored his 3rd penalty of the tournament to give France the lead. During halftime, the score stood at 2-1. In the second half, France truly outshone Croatia. France looked like a much better team compared to the second as they built on their foundation provided by a little bit of luck in the first half brilliantly. Two curling goals scored by Paul Pogba and once again Kylian Mbappe (who became the first teenager to score in a World Cup final since Pele) added to Frances lead to make the score 4-1 and it looked and dusted. A goalkeeping mistake made by Hugo Lloris in the 69th minute gave Croatia a little bit of hope but nothing came of it and the scoreline ended at 4-2, the highest scoring World Cup final since 1966. Instead of feeling sorry for themselves after the results of Euro 2016, the French team came up stronger than ever and delivered big during the World Cup. With a bit of luck on their side and brilliant all-around play from all over the pitch, France was a deserving champion of the world.